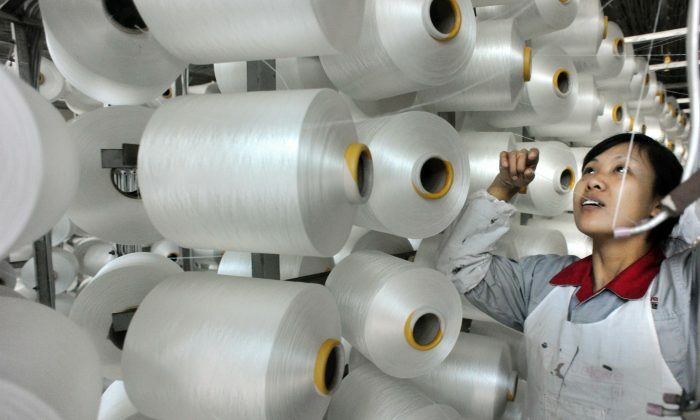 China’s manufacturing sector shrank in January for the second month in a row, an inauspicious start for 2015 ahead of the annual production slowdown for the Chinese New Year. The widely followed HSBC China Manufacturing Purchasing Managers Index (PMI) for January 2015 was 49.7, up fractionally from 49.6. It is now solidly in contraction territory after three months below the reading of 50, which is the threshold economists use that separates a manufacturing expansion from a contraction. The report, from global bank HSBC Plc, came after an official Chinese Communist Party government reading of 49.8. “Both new orders and new export orders saw downward revisions, but still signaled marginal expansion,” said Hongbin Qu, Chief Economist, China & Co-Head of Asian Economic Research at HSBC. We think demand in the manufacturing sector remains weak. HSBC also estimated that factory staffing decreased for 15 months in a row. January is typically a slow month for manufacturing staffing in China, as workers travel home for the upcoming Chinese New Year holiday. The report also said that input prices declined for the sixth consecutive month, with the rate of deflation increasing sharply in January. This is likely due to lower oil and fuel costs. China’s manufacturing contraction comes during a time of relative boon for Japan’s export-driven economy. Economists surveyed by the Japan Center for Economic Research estimated that Japan’s GDP likely grew by an annualized rate of 3 percent over the last quarter of 2014, according to the Wall Street Journal. Japanese Prime Minister Shinzo Abe’s monetary policy of low interest rates to stimulate the economy and weaken the Japanese yen has shown the effect of boosting Japan’s manufacturing sector, which relies on exports. While Japan’s economy remained in stagnation over the last two years, Abenomics has boosted its manufacturing sector. The weak yen, relative to its competing neighbors Korea and China, have ramped up production at companies such as Sharp Corp. and Panasonic Corp. The Chinese yuan has strengthened against the yen by 11 percent in the last year, and by 22 percent over the last 24 months. This doesn’t bode well for China’s manufacturing sector. Over the last decade, China has transitioned its export-dominant manufacturing sector from low-cost commodities such as clothing and household goods to become a producer of high-tech equipment and machinery such as auto parts and electronics. This has put China in direct competition against Japan. And given the Chinese yuan’s recent dive in offshore trading, it’s simply a matter of time before the People’s Bank of China decides to lower interest rates. The president of China’s major bank Minsheng Bank was reportedly taken away by central anti-graft organization for corruption case investigation of high level official Ling Jihua.